Though the consortium of banks, led by SBI, initiated measures to get back their monies aggregating `9,000 crore (including interest), the slow pace has just made the recovery process a great deal longer. 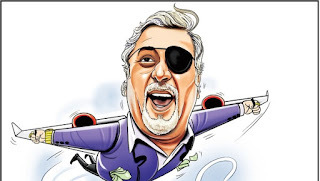 On Wednesday, the Supreme Court was informed Mallya was no longer in the country, which then issued a notice seeking his response in two weeks. The next hearing is on March 30. The banks rightly moved the apex court on Tuesday to prevent Mallya from leaving the country, but it was a tad too late. Mallya had dropped the biggest hint about his intention to be with his family in England 10 days ago, February 25, to be precise, when he stepped down as chairman, United Spirits Ltd, now part of Diageo. With just a stroke of a pen, he ended a year-long boardroom battle with Diageo in return for a $75-million ‘sweetheart deal’.